Meretz MK, mayor of Arab town visit Samaria town to console family of elderly Jewish man murdered by terrorists ahead of Sukkot holiday. Relatives of a Jewish resident of Samaria who was found murdered by Arab terrorists in Kfar Qasim earlier this month were visited by some unlikely guests Monday, as the family observed the traditional mourning period (shiva). On October 4th, just hours before the start of the Sukkot festival, Reuven Shmerling was found dead at a warehouse in the Israeli-Arab town of Kfar Qasim near his hometown of Elkana in western Samaria. The murder, which took place just hours before Shmerling was to have celebrated his 70th birthday with his family during the Sukkot holiday, was condemned by the mayor of Kfar Qasim, who rejected suggestions by that the murderers were local workers involved in some kind of business dispute with Shmerling. Shmerling’s killers, it was later revealed, were a pair of terrorists from the Palestinian Authority-controlled town of Qabatiya in northern Samaria. After the close of the Sukkot festival, Shmerling’s wife, Hana, and his four children received condolence calls, with hundreds of visitors making their way to Elkana to share in the family’s pain. 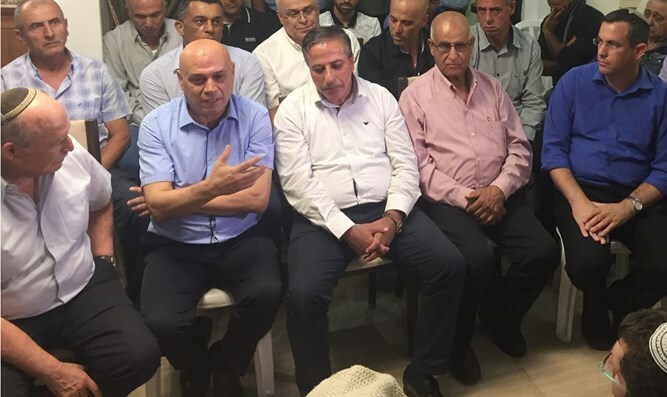 On Monday, the family was visited by a delegation of Israeli Arabs from Kfar Qasim, including Mayor Adel Badir and MK Issawi Frej (Meretz), a lifelong resident of Kfar Qasim. The delegation sat next to Jewish Home MK Nissan Slomiansky, a friend of Reuven Shmerling and rabbi of the Moreshet Yehudit synagogue where Shmerling had served as cantor during the Rosh Hashanah and Yom Kippur holidays. Frej noted the political differences between himself and the Shmerlings, but emphasized that Elkana and Kfar Qasim had nevertheless managed to maintain positive relations. “We came here first and foremost as people; as neighbors wishing to console neighbors,” said Frej. “And that’s also what you, the mourning family, did, as well as the residents of Elkana. You mourned, you didn’t blame. “That’s what Elkana did, and that’s what Kfar Qasim did as well. “We’re here to console and share in your pain. Despite the ideological distance between us, the geographic closeness is much more important.